Days after a leak claimed to show off an LG G7 ThinQ in a case, new images have surfaced that may give us a clear look at the upcoming Android flagship. 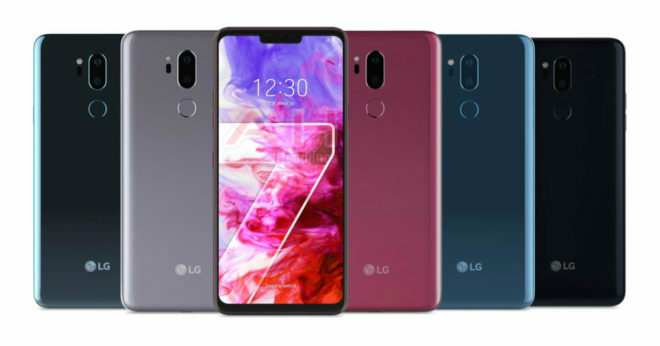 New renders of the LG G7 ThinQ have been shared by Android Headlines, who claim that the images are official. They show a phone with slim bezels and a notch at the top of the screen, while the back of the phone is home to a vertically stacked dual camera setup and a fingerprint reader. Nothing is official until LG says that it is, but the device shown in these renders do look like an updated version of the LG G6. The top and bottom bezels look like they could be a bit smaller than those on the G6, and there’s the addition of the notch and tweaking of the rear cameras, but I could definitely see LG launching this device to the public. As for when that’ll happen, rumors have said that LG will launch the G7 ThinQ in May with a Snapdragon 845 processor, 4GB of RAM, and 64GB of storage in tow. While we haven’t heard about specific about a T-Mobile release, it’s likely that the LG G7 ThinQ will make its way to T-Mo since LG’s recent flagships have all made their way onto T-Mobile’s shelves, too. The “notch” is F N ugly! Please stop. I will gladly by an LG after the “notch” craze is over. I will stick to my G6 for now. For me it’s the f’n curved screen that makes it impossible for a screen protector to stick to the glass and/or cover the whole surface, and just increases the risk of glass breaking. I bought an LG V30+ and it’s already driving me nuts; but considering it’s got less curvature than the Samsungs, those must be even worse on screen protectors. It’s more than that. It’s sad when phone makers copy iphone. Plus it’s latest design is asymmetrical. =Ugly. You realize the Essential Phone was out months before the X right? then I’ll say it again too. why do some Androlid OEMs feel the need to copy Apple? I mean, of all the features they could have copied, why the notch? It’s such a controversial feature. For a company that’s struggling to survive, which genius at LG decided to go this route? This is like waving the white flag by saying “I have no ideas left. So let’s do what Apple does”. Well, looks like the G7 or whatever it’s called, will be another big tax write-off for LG! Bingo! Essential who??? And, yes, I’m aware that Apple copies Android OEMs as well. But even if Essential did come out with the notch first, it doesn’t mean that it’s OK to use it. There’s been a lot of negative discussions about the notch. Don’t the marketing people at LG know that this is a controversial feature? And for them to go ahead and use it on their flagship, well, it just reeks of incompetence. Been an LG supporter since V10, which I still use and love. If Sammy stays “notch-free”, the Note 9 is my next device, definitely! Is there a “practical” reason for the notch – or is it just there for cosmetic reasons? That’s where the front facing camera and other sensors are located. Likely the headset speaker as well. Honestly, prefer the S8 thin bar vs “notch”. Was a long time supporter of LG android devices, like their innovation (but despise “me too notch”). Only thing keeping me on Samsung mobile is Samsung Pay (MST) and Knox Secure folder. Thanks, I picked up the S3 @ Costco $239 (non-LTE) and my 14 year is paying $200 for for older sister S8+ remaining 12 months. Eldest has had the S9+ for about 10 days. While in prefer LG UI and innovation over Samsung, as slow as the OS and security updates are on Samsung, they are still better and EOL is further than many Android phones. Yes, T-Mobile also slows down the release of updates over OEM. Sorry LG.. got tired of another LG (G6 this time) randomly rebooting on me. Especially after my G4 fiascos. You gave a few owners of LG a nice credit, but everyone else got shafted. As much as I liked the LG products (had G4, G5, and G6), I just traded my G6 in for the Galaxy S9 and not looking back. really LG The Notch reviews said was horrible???? ?